This article is written with an intent to explain in detail behind the making of a simple surround-sound decoder circuit. The concept of the decoder was first introduced by David Hafler in the 70s. His research illustrates the way to use two speakers as rear speakers on a surround system. According to Figure 1, Hafler designed the circuit to enable the rear speakers generate the difference of signal between right and left output. While every stereo encoded system maintains difference of signal between the right and left channel, it is that difference of signal when received by the rear speakers gets reproduced. However, it is vital to keep in mind not to earth the negative terminals of the rear speakers, else the rear will behave parallel to the main front speakers. 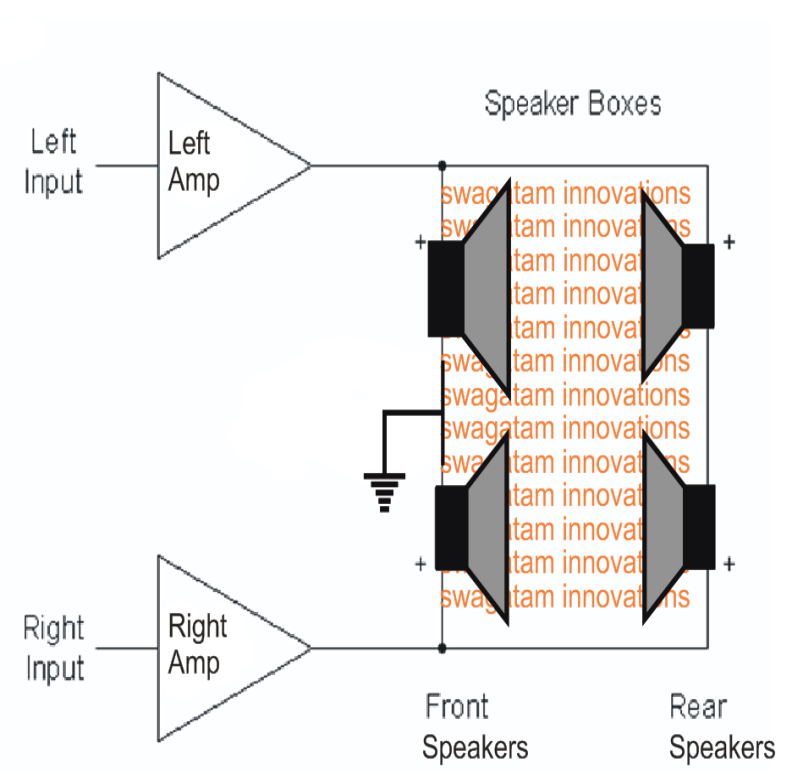 Using individual amplifier for rear speakers is not actually possible. However, there is a way-out which we figured out after some research. Referring to Figure 2, it is totally passive, but it needs an ideal transformer – a transformer with impedance of 10K [1:1 ratio], which is quite rare to find, but available. As an alternative we have tried using a 600ohm unit. But it is for the impedance the output we received was not good as it lacks bass. However, upon loading the transformer, it increased the bass quality but the preamp doesn’t seem to work at its fullest because of the impedance. It is for this reason that we have used telephonic transformers with 600:600ohms, and it worked well. The circuit in Figure 2 illustrates the way we followed. Following this design, it worked, but it has very low impedance on all cases barring solid-state preamp. Using 600ohm unit, the loss generated is around 3dB. The low frequency is -3dB on 100Hz. However, it varies based upon the quality of the transformer. 600ohm telephony transformer is widely available in the market, but many of them are not up to the mark to use it in this experiment. Most of the hi-powered transformers are sold in bulk and is therefore hard to procure a single copy. So, the alternative would be to use dual opamp to design the system, and its process is mentioned below in detail. The schematic diagram in Figure 3 gives a detailed view behind this development of the simple surround sound decoder circuit. While the new design [Figure 3] will follow Hafler’s principle, this new circuit has simplified wiring, albeit we needed extra power amps. There is now a center channel signal and the sub-woofer to receive mono signal is also set. You may have encountered similar type of circuit on other papers, but there are some twists into it. We avoided any active electronics on left/right channels and introduced opamps to zero down the factor that may cause degradation of sound. The 50K impedance will not pose any barrier for a preamp, as the main signal is parallel to the additional circuit. Extra volume control has been excluded from the system, because of the presence of volume control in the preamp. Moreover, the power amp of rear channel also has level control to balance the front and rear levels. Please note, if you are following the circuit as in Figure 3 do ensure to make the rear speakers wired-out phase. Let one speaker connect to the amp on a normal fashion and the second should be connected keeping the leads of speaker reversed. Though the difference maybe negligible, but to derive the best quality effect it is always advisable to opt for out-of-phase connection. This helps in maintaining left-right and right-left signals. A1 opamp should be connected in the form of subtracting amplifier, and if same signal is passed to both speakers, the result will be Zero. This will result to removal of all information that are common from the stereo signal, and would produce the difference signal, similar to that of Hafler’s. A2 on the other hand is a summing amplifier. Its output has all necessary information from the left and right channels. VR1 pot is set to level the center channel. It can either be a conventional pot or trimpot with the rear mounted. Adding up the two channels [left / right channel] where signal is not mono, -3dB will be will be the level of center channel. For instance, if the center channel speech is mono then the level becomes equal on both speakers. The possibility of amp overloading or the speaker is a rare case here, since the speakers and channel amplifier are not as much powerful compared to the left/right channels. The sound of center channel does not need to be high. It has to be stable and the available level control is quite enough to generate required output. The use of C1 Capacitor is not mandatory as it provides roll-off frequency of 8kHz. This actually helps to reduce any issues on the signal of the main stereo. The output of the sub-woofer is taken from central channel mixer and added no-pass filter because it is hard to determine a sub where there is already a filter. 100ohms resistors are used to block the oscillation of opamps by preventing the capacitance of the signal lead. Following this would not result to loss in frequency, but if you use 100m long signal leads, it may pose problem. Referring to Figure 3, the rear speakers have two outputs in parallel. The reason to do it is to enable easy wiring to facilitate connection of stereo amplifier with the rear speakers. Normally, mono amplifier would do fine as long as it drives parallel to the two rear speakers. But this may not be feasible if you are using 4ohm speakers and if you do use it then ensure to connect them in the form of series. In order to enable out-of-phase connection, the red terminals need to get joined, and further connect the terminal of the speakers to the output of the amplifier. You can place the entire system on a metal case. Using metal case blocks the hum or other noise coming from mains etc. While there is no factor of heat generation, you can use small case. However, ensure to maintain space to fit the RCA connectors and rest of the components. Also, be sure to not to set the components loose as this may lead to short circuit. You can wire the components and the dual opamp on a Veroboard. Also do ensure to apply 1% metal film all over it to lower the noise. You may keep the RCA connectors hard-wired. Do ensure to check the earthing. The power supply center lap and the RCA connectors should maintain secure connection to avoid noise pickup. You can also use 100uF polyester caps to connect with 100uF supply bypass capacitors in parallel, but this is not mandatory. If you are planning to enrich the sound you can also apply delay line in order to delay the sound going into the rear speakers. But that is again not mandatory. Overall, performance of your system is fully dependent on the way you have arranged the circuit. If the proposed simple surround sound decoder circuit is not well built you may face constant issues compared to a well-built one. How can I get it to work on a SINGLE SUPPLY? (1). When the power is withdrawn from the circuit , there is a high frequency peak sound heard from the rear speakers.. i have sent the recorded sound file to your email..
(3). I have one doubt also.. What is the real function of pot VR1 ? RT, I'll try to investigate by researching the concept and if possible try to upadte the info…. RT, the first diagram shows a general configuration whereas the circuit diagram is designed with a complex configuration, and the indicated connections must be correct. By the way this post was written by another author, so I do not have much idea regarding the subject and the diagrams. I am sorry I am not quite well versed with surround sound concepts so I won't be able to provide any expert advise regarding this…. Sir in one of your previous comments u have said to test the current drawn by the battery while charging from the source when a diode is used in between the source and the battery also test the circuit without the diode.. when i am charging the battery by connecting directly to the dc source maximum charging current reading is shown in multimeter.. when a diode is used the charging current reduces ..
(1)what is the cause for this sir ? (2)how the diode acts as a current limiter ? (3)is there anyway to increase the current after the diode ? RT, a diode can never act like a current limiter, if it does then it could itself become hot and get destroyed…in your case the reduction in the current could be because of the 0.6V drop created by the diode, and this may be a significant value since the cell voltage is not large, just 3.7V. if you are connecting the battery through a transistor, then the transistor would itself work like a zero drop diode, no need of adding a series diode. and also the charging voltage is seen 6.9 V .. so i am charging the battery with an adaptor giving approx. 7 V and 500 mA current..
sir thank you .. but i still didnt get the answer for my first question.. i need to control the charging of the battery as it is a part of an automatic battery charger circuit. the battery is connected to the output transistor and its charging is controlled by the base signal applied to it.. when a higher cut off is detected by the automatic battery charger circuit before that transistor ( i am not giving the details of the circuit ) base to emitter voltage becomes zero and charging stops.. unless otherwise Vbe will be high always resulting in the charging of battery… every circuit portions other than this charging portion are perfectly working… but i am stucked in this stage.. not geting sufficient charging current for the battery even with TIP122…dont know what to do..
or use a TIP127 and connect its base with the collector of the existing NPN (should be a BC547), this junction must be connected to the positive rail through a 10k resistor, emitter of BC547 now must go directly to the negative rail. (1). i want a minimum charging current of 150 mA sir not to decrease to 150 mA… 150 or above… but in my case even a TIP122 is not giving that much current .. in its emitter terminal it gives only 80 mA current drawing from the source which is connected to its collector terminal… i need a setup to charge the battery with minimum current of 150 mA and the charging to be controlled by a control voltage ( say VBE of the BJT ). . i repeat not to decrease the current to 150 mA…. (2)and for the lamp case.. I just need a emergency lamp with some features like dark sensor, touch switch etc… I am taking the output between the collector of the output transistor and the +ve battery terminal…. since i got highest value with TIP122. I thought a pair of TIP122s connected in darlington mode will give the maximum possible lumens ( brightness ).. but it resulted only a slight difference.. merely 1900 lumens… so i am asking you how to get minimum 95 percentage of lumens ( brightness ) ? the first sentence in your earlier comment confused me that's why I wanted to get it clarified. As I mentioned you can try a slightly higher voltage with TIP122 for boosting the current. By the way if you are getting 250mA by direct connection then why not use it in that way? Direct connection will give you the highest possible charging current, although that would mean a constant monitoring making sure that the cell does not heat up. Your meter readings are incorrect. There cannot be so much difference between direct connection and connection through a mosfet or BJT, provided these are correctly configured. The correct method is to keep the LED at the end of a pipe and check the lumens from the other end of the pipe. BC547 cannot handle more than 100mA so testing with BC547 is out of question. TIP122 is fine…and it should give you 99% of brightness, unless you are doing something wrong. Sorry, do you mean you want to decrease the current to 150mA..?? with TIP122 try 6V, that will boost the current a bit. 2) what exactly are you trying to make, please explain it correctly, is it a DC lamp dimmer circuit? By the way a mosfet or BJT will produce 99% full brightness on the lamp…what you are saying is incorrect unless your transistors are faulty. Sir in the surround sound system circuit, why the rear right speaker's input is taken from the same input pin of reat left ? why same input for rear right and rear left ? can you please explain the functions of these pins and connections ? RT, the respective signals are processed by the two opamps in such a manner that only the difference of content between the two channel are reproduced across the rear channels…all the frequencies which are similar are rejected. Please go through Hafler's principle which might help you to understand the concept with greater depth. sir in a simple charging circuit, positive of the battery ( say 3.9 V ) is connected to the Emitter of a NPN transistor and the +ve charging voltage from an adaptor ( say 5 V , 500 mA ) is connected to the Collector terminal.. so according to the transistors working principle the charging can be done only if a Vbe is applied.. so i have a control voltage of 5 V to control the charging.. when i am applying 5 V in the base through a 10K resistor the battery is getting charged… but the problem is the amount of charging current drawn by the battery from the source is very less ( say 60 mA ) eventhough the adaptor is capabl of delivering 500 mA charging current … i have tried using PNP, power transistors, BD139 but no considerable change has been seen… can you please suggest a better solution for this ?.. A circuit which can charge the battery with its maximum deliverable current but under a controlled signal ? Hi RT, the NPN should be preferably a Darlington type, for example try a TIP122 and see how it performs. You cannot force a battery to consume current above its rated capacity, if you do so then it can get damaged. I would suggest that you connect your 5V supply directly with your battery through a 1N4007 diode and check the current, if still your 3.7V Li-Ion cell consumes 60mA then probably it could be faulty…please check this first to confirm the exact reason of the issue. i was also searching for that in the website.. but didnt succeed to find any information regarding that.. i got aome pdf about this ic.. that is all.. but no such information is broadly given in these pdfs.. i got this ic from a 2 year old chinese touch emergency lamp… this ic is very feasible to operate with touch input. other than its touch function we can control its output voltage by continously pressing on the touch plate which causes a reduction or increment of output voltage from the ic which will immediately affects the brightness of the lamp…. also since this ic not available in local markets i am not ready to experiment with this ic for any reset input anymore…..
you can try by switching the supply off and then ON to check whether or not the IC resets back to zero…if this does not happen then it would be difficult to accomplish the required outcomes. OK, but does the IC SGL8022W have a reseting facility in it or can it be reset if by switching it OFF and then ON? (3). THIS IS A VERY IMPORTANT AND CRUCIAL CONDITION. Suppose the power failure occurs during night… the LED lamp turns on automatically…. Now if i want to turn off the led I press the touch button.. so a logic should be needed which will immediately turns off the lamp completely when a manual touch is detected during night power failure .. and at any instant, during the power failure stage, if the user wants to activate the lamp again, another touch will have to do the purpose. Now suppose i have pressed the touch switch during night power failure to turn off the LED .. now the LED turns off.. Touch button output is high now ( since the SGL8022W latches its output state untill the next touch input arrives ) .. suddenly power returns.. now the dark sensor output becomes in low state but the touch output still remains in high state… because of this LED turns on again when the Power returns.. but i don't want this to happen … whatever may be the condition of lamp during night power failure, it should automatically be turned off when power returns. the normal problem caused is if we are enabling Touch operation during power available and when suddenly power failure occurs, the lamp doesnt turns on automatically since the touch enable is detected similar to case (3) which will cause the lamp to immediately turns to off state. Touch operation should be the primary switching option which should be able to override the other options anytime. During power failure when the LED is switched OFF through the touch switch, the situation should reset to the initial condition as soon as power is restored. The circuit should not light up during day unless the touch switch is activated. sir actually what i need is when darkness is deteted during power failure ( say power failure during night ) an led lamp should turn on immediately and when the power returns it should turn off automatically…. if i am using a OR logic for the DARK SENSOR output and the TOUCH ACTION i can never switch off the LAMP if i wish to do that during power failure at night ( say when the DARK SENSOR is functioning).. so please suggest a suitable logic for this sir. you can do this, configure the LED with the transistor associated with the LDR circuit, and configure the touch sensor transistor with the LDR transistor such that it switches it ON/OFF as per the touch operations. sir please reply to my email… what is the problem in my circuit sir ? which circuit are you referring to? Sir actually what happens in a less expensive surround sound system which doesnt utilize any types of dolby or dts decoding method ? (1). Are the processes which these systems doing only addition and subtraction of stereo signals ? (2). Are those hometheatre systems available in market at cheap rate ( below 5k or even 10k ) based on this principle or using correct decoding according to dolby algorithm ? How to control the volume of the entire setup ? 2). can i add a separate amplifier section for a subwoofer of 100 W power rating at pin no. 6 of the IC TL072 for good bass ? for that can i use the circuit posted by you in this blog ?